Today, my dear friends, is a lesson is the importance of scale. My clients had a living space that was dominated by a large sofa. They were in need of a guestroom, an office, and an extra place for the family to watch television, read, and relax. However, the room couldn’t function to meet the family’s needs because there wasn’t any space to do anything in the room but lounge on the couch. 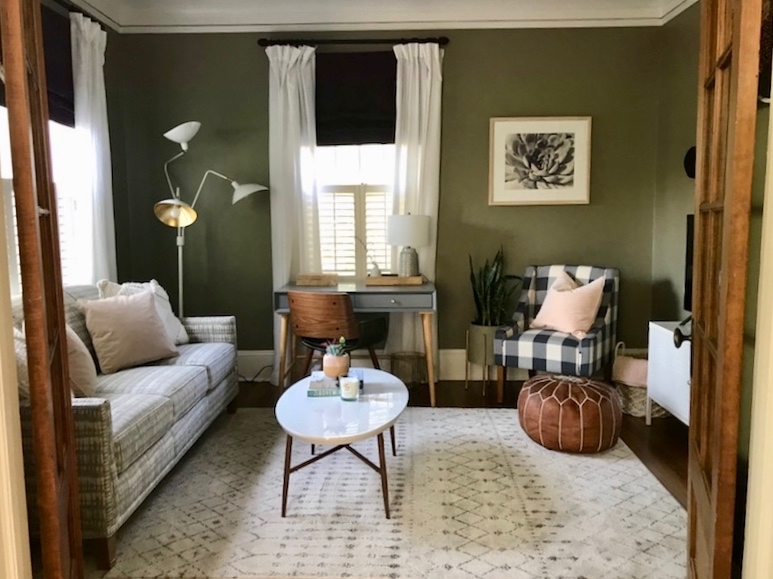 Inspired by their travel photos that chronicled their adventures before children, we started transforming the room by scaling down the furniture and gaining all.the.function. This Rowe sofa, upholstered with the child-friendly and stain-resistant Crypton fabric, folds out to provide a comfortable guest bed. 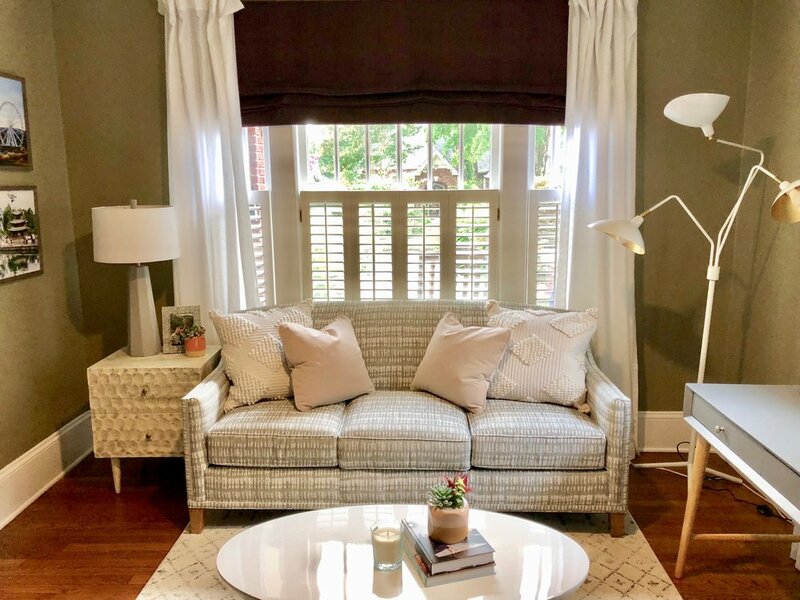 The family’s design-savvy four-year-old picked out the fabric for the couch and he was THRILLED to see how well it turned out during the room’s reveal. The rug is also made out of child-friendly polypropylene and is extremely easy to clean. The midcentury lamp provides targeted light to the sitting and work spaces in the room while work is tackled. The buffalo check side chair and leather ottoman provides additional seating when guests are in town. To provide the kids (and adults) with a comfortable place to binge Netflix, we placed the television on a simple IKEA cabinet that provides additional storage in the room. The family’s need for an office space is satisfied with this simple, modern desk and olive and walnut midcentury desk chair. When there’s work to do, the french doors can be closed for privacy. Simple changes, especially the selection of properly scaled furniture, added multifaceted function to this room. It’s not only comfortable, its a personal reflection of the family’s journey and they are so excited to share this space with family and friends.